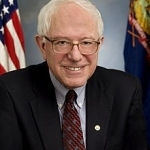 Democratic presidential candidate Bernie Sanders will be at a Friday afternoon rally in Madison. Sanders earned his biggest primary victory in the Badger State during the run-up to the 2016 presidential election. He defeated Hillary Clinton in 71 of Wisconsin’s 72 counties. Sanders’ three-day campaign swing will also include stops in Wisconsin, Michigan and Pennsylvania. His Madison rally will start at 5:00 P-M at James Madison Park.